EconoMonitor : Don't Shoot the Messenger » Greece: Last Exit To Nowhere? Greece: Last Exit To Nowhere? Paul Krugman – How Reversible Is The Euro? Really, I don’t think of Calomiris as a prophet (or even as a Cassandra), I don’t even think of him as an especially insightful economist when it comes to the macro problems of the real economy, but I do think he has one exceptionally strong merit: he can do the math, and as he says, if it gets down to a battle between legal details and arithmetic, arithmetic will always win. Easy Said & Easy Done, Down the Argentina Path We Go! As it happens, the issue of Argentina as a reference case for Greece has surfaced again this week, in the form of an Op-ed in the New York Times by the co-director of the Center for Economic and Policy Research Mark Weisbrot. Weisbrots’s argument is not new, but it is different, not only because he thinks Greece would be better off leaving the euro (many economists share that opinion), but because of the apparent eulogy he makes of the Argentine case. Now these are strong claims. But let’s leave aside the issue of whether or 11 million people were pulled out of poverty or not, and dig a bit deeper into what actually happened in Argentina, and let’s do this by comparing it with another country, one which arguably has similar social and economic development characteristics, Chile (see chart above). At the turn of the century Chile had a population of more or less 15 million, as compared with the 39 million Argentinians mentioned by Weisbrot. Now in 1998, just before Argentina entered its depression, Chilean GDP was some 79 billion dollars, while Argentina’s was 299 billion dollars. 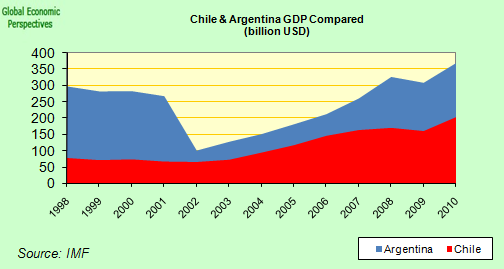 Now let’s fast forward to 2010, Argentina’s GDP at the end of last year was 370 billion dollars, and Chile’s 203 billion. That is to say, between 1998 and 2010 Argentina’s GDP (as measured in dollars, we’ll come back to this) increased by 24%, while Chile’s increased by 156%. As they say in Spanish “no hay color” (there is simply no comparison). Especially when you take into account when that Chile has only 38% of Argentina’s population, while it has 55% of Argentina’s GDP. So over the 12 years between 1998 and 2010 Chile (which maintained a floating currency throughout) evidently did a lot better than Argentina (despite Argentina’s abandonment of the float). And here’s another relevant piece of information: between 1998 and 2010 the Argentinian price level rose by 143%, while in Chile the price level rose over the same period by 48%. “In our view, …(the results of our study)…. point to the conclusion that exchange rate devaluations do not lead to permanent competitiveness improvements in rigid economies, such as in the Eurozone periphery. In this context, tail risk scenarios about EUR exit are misplaced. Structural reforms are the best bet to improve the periphery’s growth prospects, within or outside monetary union”. Does this whole debate sound familiar to anyone? Anyone remember when Italians were paying themselves in million lira notes? In fact, it was precisely to break the Southern European countries from the high inflation, high interest rates, periodic devaluation dynamic that the Euro was thought to be such a good idea in the first place. It hasn’t worked as planned, but that doesn’t mean that the most traditional and the most simplistic solutions are necessarily going to be the best ones. On the other hand, does this mean we should then go on to dismiss the coming out of the euro option out of hand for Greece? Evidently not. 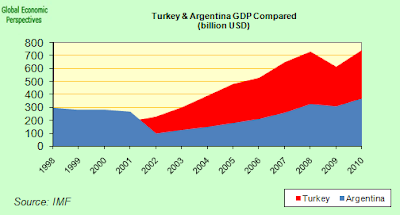 Let’s look at another comparison, this time Argentina and Turkey. Now in 1998 Turkey had a dollar GDP of $269 billion, and by 2010 this had become $742 billion. That is it had nearly tripled. Yet Turkey’s dollar GDP dropped sharply in 2001 following a substantial devaluation of the Lira. Conclusion, competitive devaluations are sometimes useful, so what makes the difference? “Greece, as a relatively poor country with a history of shaky governance, has a lot to gain from being a citizen in good standing of the European project — concrete things like aid from cohesion funds, hard-to-quantity but probably important things like the stabilizing effect, economically and politically, of being part of a grand democratic alliance”. We can sum the essence of all this up in a couple of phrases “institutional quality” and “structural reforms”. Or put another way, Turkey devalued as part of an IMF programme (it was actually recommended, in the days before the heavy hand of the EU took management control at the IMF), while Argentina broke the peg and devalued in order to get out of one. Turkey was not only able to benefit from the reform pressure instigated by the IMF (the stick), but also by the promise of EU membership under certain conditions (the carrot). Indeed, curiously, EU cultural reservations about Turkish membership have probably lead to far stricter reform hurdles than were either applied to the current members in the South or the East, and Turkey is undoubtedly the great beneficiary of this strictness. “That said, Weisbrot is right in saying that the program for Greece is not working; it’s not even close to working. At the very least there must be a debt restructuring that actually reduces the debt burden rather than simply stretching it out. And the longer this situation remains unresolved, the less hope I have that Greece will be able to stay in the euro, even if it wants to”. The present situation is unworkable, and unsustainable, not only because the accumulated debts are unpayable by Greece alone, but also because the tiny size of the manufacturing industry Greece has ended up with and the general lack of international competitiveness of the Greek economy make an export-lead growth process with the present state of relative prices virtually impossible. There are solutions to both these problems consistent with remaining within the Eurone and without default – issuing Eurobonds to accept part of the Greek debt and enforcing a substantial internal devaluation to restore external competitiveness, for example – but since the adoption of these two strategies is virtually unthinkable given the current mindsets in Brussels, Frankfurt, Berlin and Madrid then we are more or less guaranteed to find ourselves facing some kind of Greek default, and given that the programme as it stands isn’t working (this is where the situation so resembles pre-default Argentina as the extent of the fiscal correction means the economic contraction feeds on itself given that exports cannot expand fast enough to counteract the decline in government spending and domestic consumption), it would be strongly advisable to accompany this default with some sort of devaluation. Put another way, if the most valid argument against going back to the Drachma always was that this would imply default, now that default is coming, why not allow Greece to devalue? As Krugman says, the issue isn’t whether Greece would openly decide to exit the euro, the issue is what happens if the markets force this solution on Greek and European leaders against their will? Given the programme isn’t working, the likelihood of this kind of event occurring in the next 2 or 3 years is far from being negligible, so why not be proactive rather than always relegating ourselves to being reactive? What matters is whether Greece becomes Turkey (oh, what a historical irony) or Argentina. If the powers that be can agree on an ordered restructuring of Greek debt, and a controlled exit from the Eurozone, then Greece has some possibilities of turning the situation round. If exit is forced on Greece in order to escape the clutches of both the EU and the IMF then the move will be, as I suggest in my title, simply the last exit to nowhere. And especially in a historic context of ageing populations and rapidly rising elderly dependency ratios, ratios which will only rise further if thousands of young people exit Greece in the search for work elsewhere, as young Argentinians did in 2002/3. That’s another difference most people who make this comparison don’t mention: when Argentina devalued the country still had a fertility rate which was slightly above replacement level. Greece has just had more than 30 years with a total fertility rate in the region of 1.3. So while Argentina could look forward to years of demographic dividend and rapid “catch up” growth, if things go wrong Greece can only look forward to an ever older population and ongoing social and economic decline. The tragi-comic events surrounding the fate of IMF Director General Dominique Strauss Kahn may well mean that we are about to see significant changes in that organisation. It is to be hoped that, if this is the case, such changes will also involve a rethink of the IMF’s role in Europe’s crisis, and in particular of the objectives and means of implementation of the Greek programme, with the Fund moving towards a less-eurocentric and more balanced position, one which would be in the collective interest of the community of citizens of the wide variety of countries the institution represents.